It has been long said that fragrance is perhaps the most personal aspect of anyone's beauty routine; what one person loves another will love - if one thing will divide all beauty lovers it is fragrance. I have my signature scent wardrobe down to a fine art - Thierry Mugler Alien for the Autumn/Winter months and Narcisco Rodriguez for Her the rest of the time, I do flirt with other fragrances regularly but those are the two I always come back to. In the Summer months I do tend to rely heavily on Estee Lauder Bronze Goddess, Escada Rockin' Rio and D&G Light Blue as do many others - they work well in the heat, are non-cloying and both hold a lot of lovely memories which come alive when inhaled. When it is time to hit Duty Free I tend to purchase on a whim - I become overwhelmed with all the choices and truthfully don't always make the right choice. Let's stop that from happening again. This year I am on the look out for a beautiful aquatic scent yet not masculine, light yet long wearing, ideal for spritzing on both home and away and ideally will remind me of warmer climes. I am not a fan of Davidoff Cool Waters nor do I want to pack a bottle of Tom Ford in my case, so I turn to you - what do you recommend for summer wear? My favourite summer perfumes (don't judge) actually come from Victoria's Secret Pink. Hugo Boss Orange for her is a really nice one for spring/summer. It's a bit of a warmer scent. I don't really know how to describe it. I also like Nina Ricci L'Elixir. It's a tiny little apple bottle. It's kind of fruity but also makes me think of plants and trees. I didn't realise they still sold Rockin Rio, I used to buy it as a teenager! My favourite summer fragrances have got to be Prada Candy and Viva La Juicy but I do often like M&S perfumes when I'm in the market for something cheap! 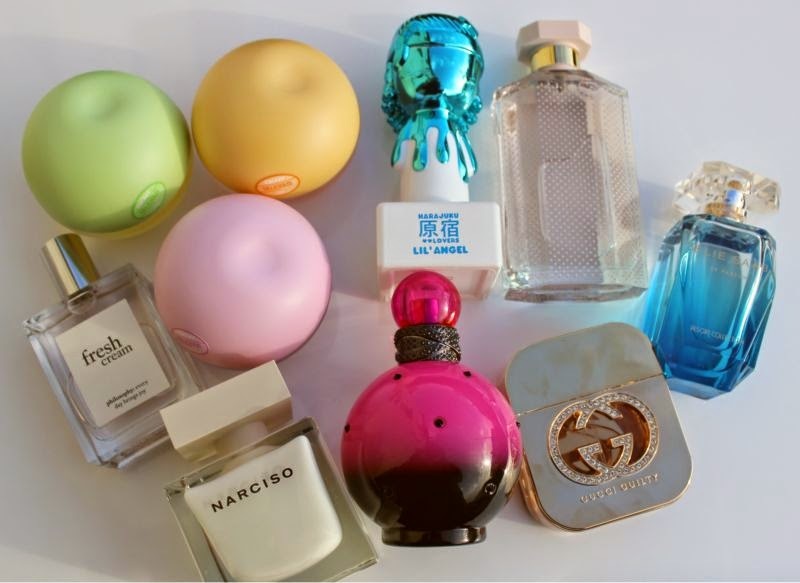 I love perfume. I have too many favourites! I really fancy treating myself to another now. Tom Ford Black Orchid in the A/W months, and SJP Lovely or Diesel Loverdose in S/S - I like to mix it up with some others but those are always staples! I would definitely recommend Marc Jacobs scents! They're so light and refreshing to wear. Also Loverdose by Diesel. It reminds me of summer evenings out and about. I really need to smell the Estée Lauder perfume, I've heard so much about it and it comes back on blogs and on YouTube each year for summer... Maybe my next summer fragrance! Not sure if it's what you're looking for but I'm loving Marc Jacobs' Daisy now we're into Spring! Hi- I love Jean Paul Gaultier Fleur du Male. It is a men's fragrance in a white naked man's body bottle..all a plus...but the fragrance is green with lots of orange blossom and is lovely for girls too. I really like D&G light blue for a nice fresh scent in the Summer, I've worn it for years. I discovered a couple of Summers ago that Marks and Spencers actually do a perfume called Azure Breeze which I swear is IDENTICAL to it. It's only £16 for 100ml. It doesn't last all day but I don't mind for that price, I just put some in an atomiser for my handbag. Ralph by Ralph Lauren is one of my all time favourites that I always wear during the warmer months, it's a lovely aquatic, clean and fresh scent! I work in a perfume store and I would definitely recommend, Hugo Boss Orange, its a beautiful light fragrance perfect for the summer months and it lasts hours on the skin! I would also recommend Marc Jacobs' Daisy Dream, its another light one and lasts a good length of time, its perfect for summer and for spring time so its a good transitional one. Also a good one is the new Armani Si EDT, its lighter than the EDP but still has the same unique smell, sweet yet spicy, perfect all year round but particularly the summer. This one lasts a good day on my skin and depending where I spray it (back of the neck is my favourite) I can often smell it on my skin when I'm showering the next day! I really like Liz Earle Botanical Essence No. 1. Not sure if I'd describe it as aquatic but it definitely feels like a Spring/Summer fragrance. Also Fragonard perfumes are amazing. My absolute favourite brand. It's a French company and they sell a range of fragrance products like shower gels and soaps but they also do eau de toilette, eau de parfum and pure perfume. Huge range of scents as well. My personal favourite is Emilie, but it's quite a heavy scent. I think Marks & Spencer stock some of their perfumes.